Life is a funny thing. Some days it goes well. 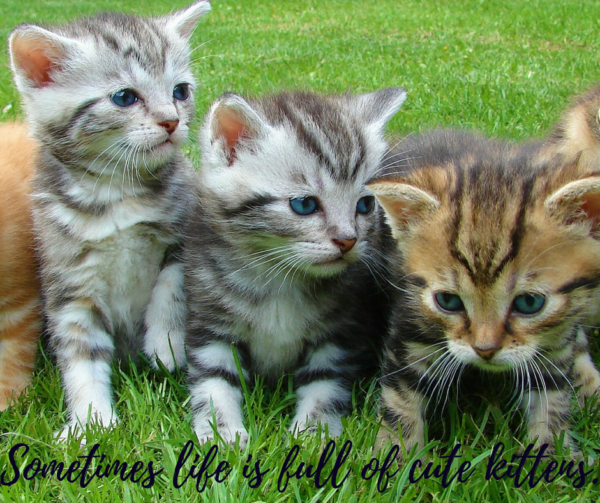 Everything is sunshine, rainbows, and kitty cats. Then some days life takes a sharp left turn into the raging storm that sweeps you off the bridge and into the choppy waters of uncertainty where you’re stuck between an alligator and a swarm of jellyfish. And let’s face it, one alligator in the water with you is one alligator too many. Lately, my life has felt like it has more alligators than it has rainbows and more raging storms than calm little afternoon rain showers. You’re probably wondering what any of this has to do with romance. But here’s the thing – real life happens in the middle of the mess. Romance doesn’t only happen when everything is coming up roses. It’s just as likely to happen when our life is falling apart than it is when our life is looking like solid gold. I don’t generally pick on books – especially not within the realm of romance – but I will say that one of my pet peeves is when a book equates the happily-ever-after of its characters to everything in life going well. There are so many books out there where the heroine’s life is a big, fat mess until she meets the right guy. Then he sweeps her off her feet, showers her with priceless gifts and words of praise, and suddenly she’s the CEO of a major corporation (even though she dropped out of college after one year) with the world at her feet. Her happily-ever-after is tied to having met the perfect man and how he transformed her life from that big, fat mess into a world where everything goes right all the time and she can never do wrong. So, while I like a happily-ever-after as much as the next gal, I have to say, I tend to like my happily-ever-afters to have a touch of realism in them. 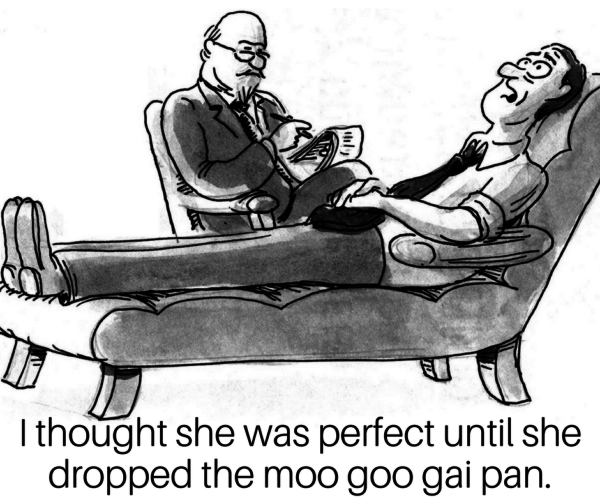 If your life looks like a plate of moo goo gai pan that’s been spilled on the restaurant floor before you meet Mr. Right, then it’s probably still going to look like a spilled plate of moo goo gai pan after you’ve met him. And even if you get that sticky spill cleaned up, being in love is no guarantee that you’re not going to dump the wontons the next day, or that your egg rolls won’t explode in the deep fat fryer because you wrapped them too tight. Life is messy, and it’s not romance’s job to change that. Romance is about falling in love – and staying in love – in the midst of all the mess. Perfection will come someday, but it won’t be in this lifetime. So I guess, in conclusion, I’d like to say that romance is about finding the sunshine, rainbows, and kitty cats while you’re swimming in the stormy waters with the alligators and jelly fish. Which, now that I think about it, doesn’t sound like a fabulous selling point for our genre. Maybe I should sugar coat it a bit. 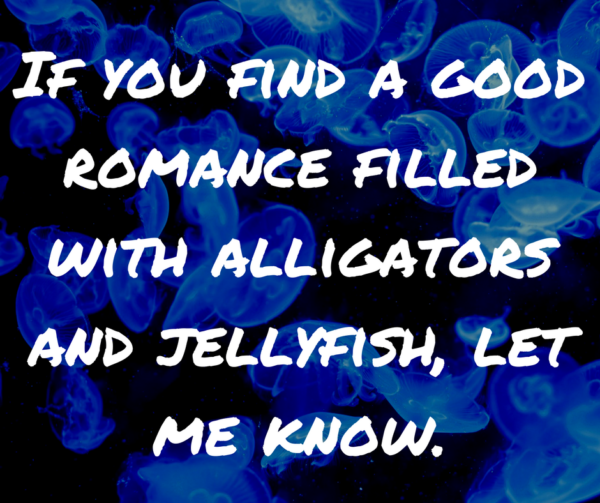 Rarely do good romances involve alligators or jellyfish. How’s that? More optimistic? Ha. I think I’ll start putting that on my book covers…not. Happy reading everyone! And whether you enjoy a perfect-life happily-ever-after or a rubber-meets-the-road happily-ever-after, I hope your day today is filled with a book you love and a great friend to share it with. HI Heather, here’s to dealing with alligators and jellyfish! The best romances are those that do not hide the real, day to day challenges. They give courage that real life can be faced head on with the grace and guidance of God. “Perfection will come someday, but it won’t be in this lifetime.” Amen! Great post, Heather! Thanks for stopping by, Jill! I never gave much thought to heaven when I was younger. As I’ve gotten older, though, I’ve realized that it really is something worth looking forward to – and how very blessed we are to have a Savior who has secured our eternity there. Thanks for the realism and a good laugh because sometimes you have to laugh through it all! God has a sense of humor- right! How funny looking are those alligators and jellyfish! When I was a kid, I used to tell people that the platypus was proof that God has a sense of humor. A body like a beaver, feet like a duck, and a bill like no other animal on earth. How could that *not* be proof that God enjoys a good laugh now and then, right? As I’ve matured a bit, though, I’ve come to understand a bit more about God’s grace. I think the fact that God has given us the ability to laugh in the middle of our hardships is just one more meaningful way in which God pours His immeasurable grace out upon us…which is yet one more reason for us to praise Him in the midst of our hardships. I totally agree with and appreciate your sentiment that romance doesn’t fix everything in life! I love my husband and I love being married to him, but my satisfaction with life remained unchanged after we got married. We got married in our 40s (it is the first marriage for both of us – we were slow starters ;) ) and were both content with life as singles. We think that makes our marriage stronger – that we weren’t looking for someone to make us happy. It sure is nice to have someone to walk through difficulties with, but my overall contentment didn’t change much after getting married. Well said, Ellie! And what a blessing that you were content unmarried and are content married. Married or single, people often feel like something is missing from their life. They want more, and they seek that “something more” in their relationships with other people rather than in their relationship with Christ. Understanding that He is all we need, that He is and will always be enough, is the key to being content regardless of circumstance or situation, regardless of marital status or even parental status. Jesus is enough. Amen!! Very Well Said!!! Some books out there that are all rainbows and kitties are good for some of those times when an escape into unrealism is needed. But I agree romance books really should have a lot of realism in it so we can identify and truly enjoy them. ” Romance is about falling in love – and staying in love – in the midst of all the mess.” That is definitely true! Nice post, thanks for sharing with us! As always, your post (and your books) caused me to think about some deeper truth while making me laugh! My mother-in-law liked to tell new brides to not make their husband the source of their happiness. Even after almost 41 years of marriage, I still remember that and pray that I’m putting my trust in the True Source of happiness. Great post! Amen!! I got married young, and nobody gave me that advice, so I had to learn it the hard way. The early years of my marriage were fraught with pain, anxiety, and insecurity for that very reason. It wasn’t until I understood that who I am in Christ is the most important part of who I am that the rest of my life became a source of joy and satisfaction. Not only did I have the wrong idea about making my husband the source of my happiness, but when we started a family, that same mixed-up thinking got transferred to my children. I’m so thankful that God put people into my life that would help me understand how unbiblical that way of thinking was. I’m a better person today – not to mention a better wife and mother – because I finally learned that important truth. Thank you for stopping by today Walter! I hope you have a blessed day! Great post, Heather! I agree! Good to see you Margaret! I hope you’re having a wonderful day! You are on the button about finding a man and happily ever after! One does not bring the other. In fact, finding a man can bring more confusion into your life. It did for me! But it also brought a friend and a partner into the mess. I have a friend who always talks about the messy details of life. We don’t live Perfect lives, we can’t! But with the grace of God, we move through the messy details of life, whatever they are; jobs, romance, sickness, accidents, families, and more. Great post, Heather! You expressed it well, and I agree! I met with two friends for coffee this morning. One tried to cancel because she was having a really hard morning and didn’t wat to spread it onto us. I told her that’s when you really need your friends so come on!